I’m sure most of you assume this book will be about the homosexual revolution in Baghdad, so I am sorry to disappoint. 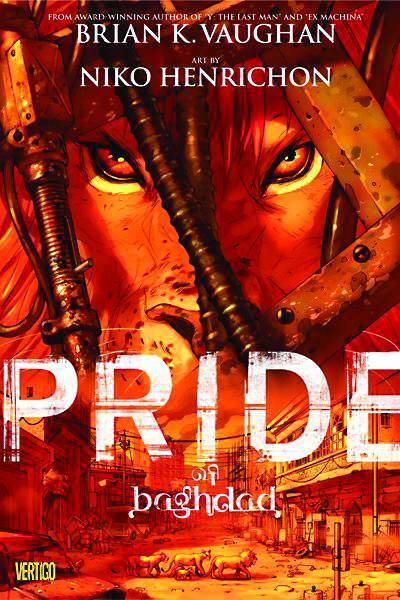 The “pride” in which the title refers to is a pride of lions that escaped from a zoo after a bombing by Americans in 2003. Written by Brian K. Vaughan, I bought this book when it came out without knowing anything about it, other than Y: The Last Man was awesome and written by Vaughan. It was shrink-wrapped and everything so I couldn’t easily flip through the pages with my greasy little fingers. Lucky for me, I was not at all disappointed. I even bought this book for my brother for Christmas one year. And in case you’re reading this, you still have a bunch of my comics you jerk! I didn’t forget! The group of lions that this book focuses on are a young male, Ali, his father Zill and mother Noor, and a much older, more jaded female, Safa. We see them in the Baghdad zoo, trying to figure out a way to escape. Shortly after, they realize that something is going on that is causing danger for the keepers, and then walls start exploding. We see them bicker and complain about what is happening around them, who is to blame, where to go for safety, and how to find food. We also realize that Safa spent a considerable time in the wild before becoming captive, and that Noor has spent most of her life in captivity, so most time is spent bickering about which life was better. We also learn of a love affair between Zill and Safa, which is obviously a touchy subject. Through the course of finding food, running into threats, and eventually coming to an end to their search for freedom, that human casualties aren’t the only casualties in war. 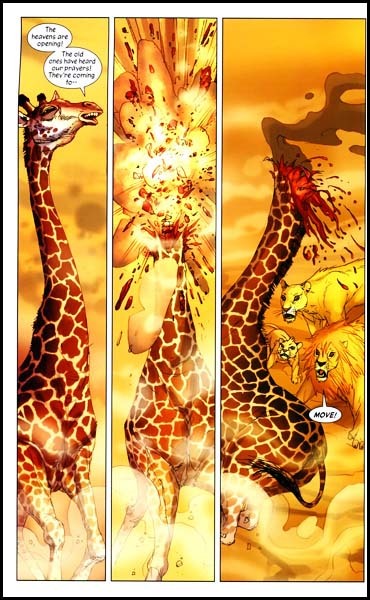 SPOILER ALERT: This giraffe’s head explodes. Sorry! It’s quite difficult using animals to tell a story, especially a story about the horror of war. Vaughan did an amazing job of telling both sides of the story, while also making a statement about the current occupation of American troops in Iraq, without being too heavy-handed. Whether it was Safa talking about being raped by multiple lions in her life in the wild and security she felt being in a zoo, or an old turtle the pride comes across who discusses how long people have been fighting over the “black stuff” that comes from the Earth, the story is approached from multiple angles. 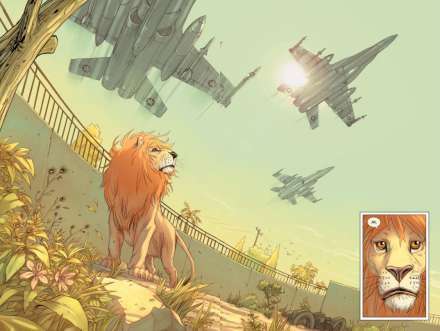 In addition to being wonderfully written, the art by Niko Henrichon is just as incredible. He has very angular and distinct illustrations that give everything not only a realistic look, but somehow also an exaggerated look. Not everything in life is round and smooth as in most books, but nothing can really be as sharp as the way Henrichon draws them, or can they? In my experience, even some of the best artists can only settle for doing a “good” job, meaning no matter how good they are, they still play second fiddle to the writer. In this case, I don’t think this book could have succeeded without the combination of Vaughan and Henrichon. I keep trying to naturally segue into all of the topics that this book touches on, from war to freedom to animal rights to civil rights, but it’s just such a complex a wonderful book that I recommend you do yourself a favor and just read it. I agree with 99% of the sentiment expressed. The 1% lacking is that you think those comics will ever be returned to you. Although now I won’t even read them, just use them for kindling. Damn you! You are always able to outsmart me using statistics and percentages!